Deep below the nightmarish, polluted hive cities of Necromunda, in the twisted, dark tunnels of the Underhives, rival gangs fight to the bitter end for personal power, survival and the honour of their Houses. 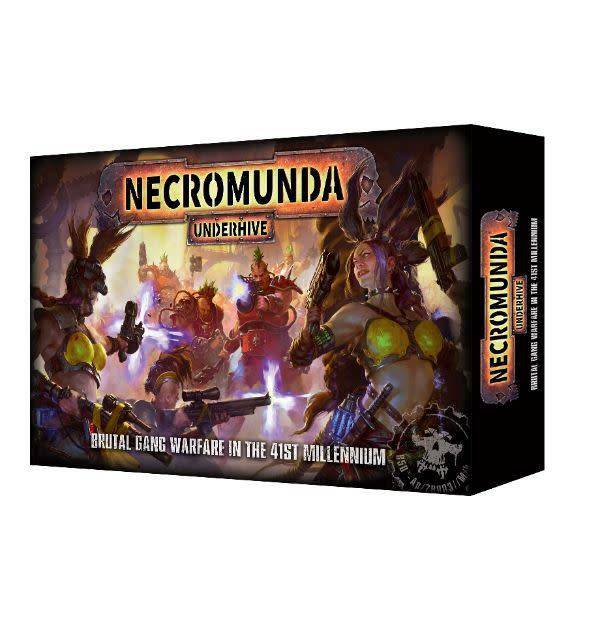 Designed for 2 players, this is a game of tactics, skill and absolute ruthlessness, set on the iconic hive world of Necromunda. Players choose 1 of the 2 included gangs in the box, and fight brutal skirmishes on the game board using everything at their disposal – ducking behind barricades to survive withering hails of gunfire before popping up and shooting back, placing and overriding traps, using the decrepit, crumbling corridors of the Underhives to unleash precise strikes before scurrying back into the dark. Survival in the Underhives is a difficult and desperate business, where violence is often the only option. 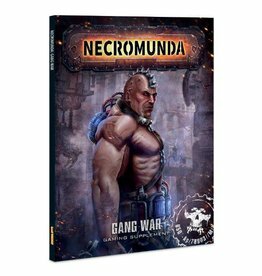 Necromunda: Underhive comes with a 104-page softback book containing all the background and rules needed to immerse yourself in the bleak industrial hellscape of Necromunda. It contains an introduction to the Imperium of Man, the role of the Hive worlds within that Imperium and descriptions of a typical Hive structure, along with in-depth explanations of the history of Necromunda, its main cities and the shady characters who populate them. Detailed descriptions of the battles that occur daily in the Underhives, and the bounty that these battles are fought over, provide the inspiration for your games. Also contained in the book are all the rules you need to play, from the basic mechanics of line-of-sight, movement and combat to advanced rules such as moving a group of models together as a team, interfering with close combat, injuries, tactics cards and even running away! The basic rules include their own scenario, designed to ease newcomers into the game – this uses its own special game tile, which is printed on the inside of the box. 6 scenarios are included in the book, each of which shows you how to configure the game tiles, how to set up the combatants, the special rules that the scenario requires and the victory conditions. 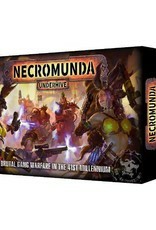 A major part of Necromunda: Underhive is the included tactics cards. These add a certain anarchy to your games – after all, there are few real rules in gang warfare – and represent the different schemes and tricks employed by Houses Escher and Goliath. They are separated into 3 distinct categories: Gang Tactics, which are 20 cards usable by any House; Escher Tactics, 4 cards usable only by House Escher gangs and Goliath Tactics, 4 cards usable only by House Goliath gangs. As well as these, there are 42 Profile cards: 10 of these feature named House Escher fighters, with their statistics and capabilities listed for reference in-game, and a further 10 do the same for House Goliath. There are 22 blank Profile cards, which you can use to create your own fighters and build your very own Necromunda: Underhive gang. 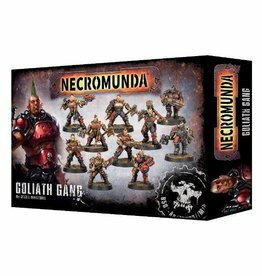 You get 2 complete, 10-model gangs with Necromunda: Underhive, 1 representing House Escher and 1 representing House Goliath. The gangers that fight in the name of House Goliath are hulking brutes, each a pillar of muscle and pent-up violence ready to be unleashed. Far larger and stronger than an ordinary human, they flaunt their strength wherever they go and it is difficult to ignore the air of brutality which Goliaths wear like a mantle. - Weapons! There are quite a lot of these: 2 brute cleavers, 2 spud-jackers, 4 stub cannon, 2 combat shotguns, 2 ‘Renderizer’ serrated axes, 2 automatic grenade launchers, 2 power hammers, 2 plasma combi-stubbers, 2 ‘Krumper’ rivet cannon and 2 stub guns are included, along with additional frag and krak grenades, 2 sheathed knives and 4 sets of stim stashes. 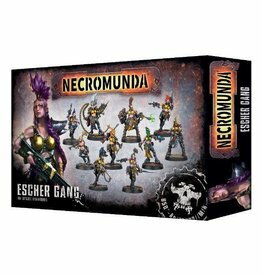 House Escher is unique among the great Houses of Necromunda, for its gangs are made up entirely of women. Masters of pharmaceuticals and chemical manipulation, what an Escher may lack in terms of raw physical strength, she more than makes up for in speed, skill and sheer psychotic flair. - A huge selection of weaponry: 6 lasguns, 8 laspistols, 6 stiletto blades, 2 shotguns, 4 power swords, 2 autopistols, 2 shock whips, 2 needler/bolters, 2 plasma pistols, 2 chem-throwers and 2 autoguns, along with additional frag, krak and choke gas grenades, 4 sheathed stiletto blades and 2 sets of chem-synth packs. Included are 25 round plastic bases – 15 x 25mm and 10 x 32mm – which feature sculpted details matching the aesthetic of the game tiles. - A set of card tokens, including 5 ducts, 3 melta traps, 2 arc of fire templates (1 for 25mm bases, 1 for 32mm bases), 24 ready/pinned tokens, 16 fire/out of ammo tokens and 16 single wound/two wound tokens. - 16 six-sided 16mm dice in yellow and black: 6 standard dice with a Necromunda icon in place of the 1; 6 injury dice; 2 scatter dice and 2 ammo dice. - A 12 clear plastic range ruler.